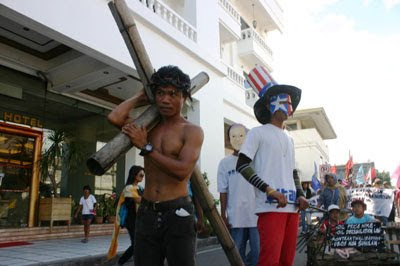 DAVAO CITY, Philippines (Mindanao Examiner / Apr. 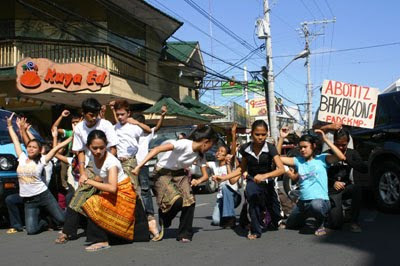 20, 2011) – Filipino political activists criticized President Benigno Aquino III for the government’s failure to curb the continued hike in oil prices in the Philippines triggered widespread protests. “Stop playing Pontius Pilate in the oil price increases. 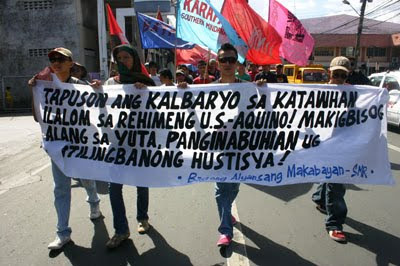 The people have suffered enough,” said Bagong Alyansang Makabayan-Southern Mindanao Region. Pump prices of gasoline in Davao City in January was at P49 per liter and now P59. It was the 13th time that fuel prices hiked in just four months and there is no sign that it would stop in the comings days or weeks. Energy officials have put the blame on the changes of prices of oil in the global market amid talks of a possible shortage. “But, we all know, and even the President knows, that these are mere speculations. His act of condoning these increases is a betrayal to the Filipino people, betrayal to his messianic promise of bringing change in the lives of the Filipino people,” Bayan’s Franchie Buhayan said. Buhayan said there is no reason to believe that the unrest in Libya, as energy officials of the Aquino administration would like Filipinos to believe, will impair the Philippine’s oil supply since Libya accounts only 2% of the Philippines’ oil requirements. She said, even Saudi Arabia, where much of the country’s oil is sourced, has assured enough supply of oil. Even the Organization of Petroleum Exporting Countries has declared an adequate spare capacity and inventory. She said speculations are what the big oil companies in the country, like Petron, Shell and Chevron, feed on to amass huge profits, a thing they were able to easily do since the Oil Deregulation Law was passed in 1996. “Such speculations always precede overpricing schemes by these companies which gobble up millions of additional revenues every day, such as the P124.49 million that Petron, which controls 38% of the supply of oil in the Philippine market, gets as additional profits in a day; Shell, which holds 28% of the market share at an additional P91.41 million per day, and Chevron, which controls 12%, an additional P40.66 million each day,” she said. On top of these overpricing schemes, Buhayan said the government also exacts 12% on the prices of petroleum products that consumers pay through Value Added Tax and this amounts to P44 million every day. She said Aquino has choices to stop these oil companies from bleeding more Filipinos – one is by scrapping the 12% VAT; by invoking the Price Control Act, or junking of the Oil Deregulation Law. 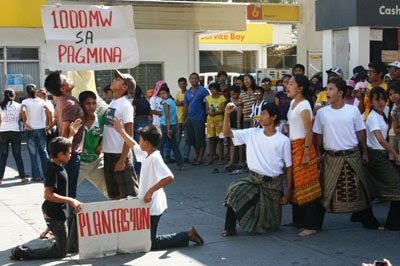 “But apparently, President Aquino chose to side with these profit-driven beasts,” Buhayan said. Adding fury to the fire, she added, is Aquino’s responses to the people’s growing clamor against continuing price hikes and calls for substantial wages. On the day oil prices increased the 12th time last April 12, Aquino warned drivers of being punished if they conduct protests.